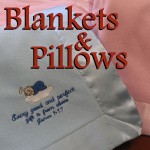 Snuggle your little one in this snuggly receiving blanket. Inspired by Sue Berk's daughter, Rachael, who was born with arthrogryposis and spent 8 weeks in the NICU, this blanket is very soft and cozy and incorporates a message that make both baby and parent feel good. The baby blanket reads, "Bless This Child" and would make a great inspirational shower or baby's homecoming gift. Measures 28" x 33" and is completely machine washable. Comes ready for gift giving with a bow. Shop for a companion cross below... perfect to top off this baby gift.